You won't want to miss today's edition of Kills of the Week, highlighting notable carebear kills from the week of January 12th @ 00:00 EVEtime through January 18th @ 23:59 EVEtime. There's a rumor going around that if you put a Damge Control Unit on your Orca, you can't be ganked. Beryl Dmitri heard that rumor and believed it. Unfortunately for Beryl, there were 12 Agents of the New Order who hadn't heard the rumor: Vic Jefferson, Victor Von Vyvorant, loyalanon, bigbud berito, Schlampa, Sophia Soprano, UICIDE, Killowatt Nearl, Dillon Hawk, Joshai, ElectroniK VeroniK, and Cadica Do'Urden got together and knocked the Orca out of the sky. I almost feel bad for Beryl. This wasn't the first Orca she'd lost. In fact, it wasn't the first Orca she lost that week. Within a space of just five days, Beryl managed to lose three Orcas. She got ganked in highsec and then moved to lowsec, where she got ganked again. 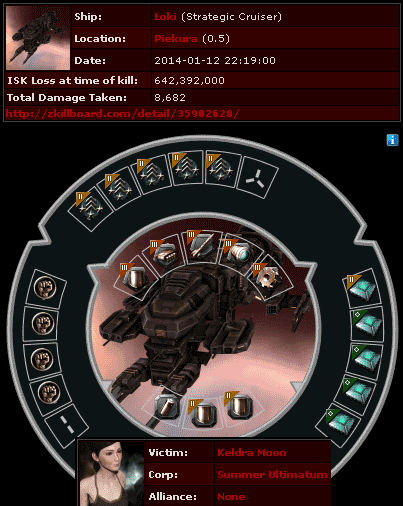 Then she bought a third Orca and tanked it up, only to die again. Time to try a mining permit? Keldra Moon put together this jaw-dropping Loki and went AFK, presumably to weep from guilt over the monster she'd made. Agents loyalanon and Sophia Soprano reported to the scene and put the Loki to death. It did not belong in this world. Once again, a miner wants us to believe he was only guilty of being a loving parent. I'd sooner believe a dictator who says his weapons manufacturing facility is really an orphanage. If you truly care about your children, you don't need to be paid for your child-caring time in illegal ore.
Aamuryn lost the Pod of the Week when got smashed by Agent Ario Drumall. Aamuryn was autopiloting. Wherever she was headed, she didn't get there. 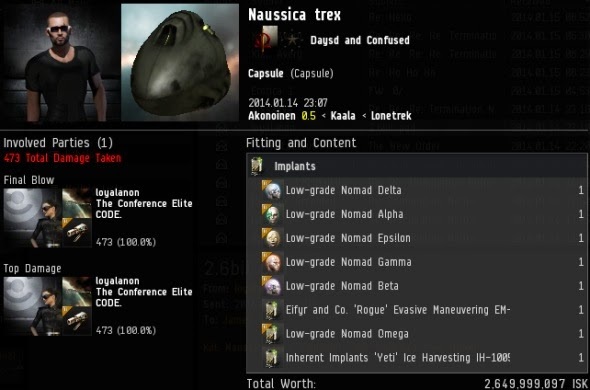 Unless her clone was set for her destination, in which case she spent 3 billion isk on a ticket for the pod express. The Wis is a carebear who watches over his army of miner alts in a fail-fit Nightmare, a faction battleship. The Nightmare had a lot of sensor boosters, but they didn't boost The Wis' common sense one bit. It only took seven brave Agents to kill him: loyalanon, Quinn Barviainen, UICIDE, Schlampa, Vic Jefferson, Sophia Soprano, and Ario Drumall. Blammo! The detonation of The Wis's implants, along with the Nightmare, set him back more than 4 billion isk that day. They say revenge is a dish best served cold, but justice tastes sweet at any temperature. Okay, okay. The elephant in the room is that The Wis was the same carebear whose epic tears were shared at Fanfest 2012 during The Mittani's CCP-approved Powerpoint presentation. A memorable incident occurred after the presentation, and some other things happened a few days later. All that aside, The Wis is in good health and I'm sure he would be the first to congratulate our Agents on a fight well fought. I look forward to the day that The Wis joins the ranks of the New Order and multi-boxes 50 Catalysts. He was elected, don't you remember the election? It's there for a reason alright, just not to be the safe AFK wrought theme park you think it should be. He's just a little girl upset at the world.... so he kills online spaceships to vent his sexual frustration. "so he kills online spaceships to vent his sexual frustration." That applies equally well to every EVE player, as EVE is an online spaceship shooting game. You might want to edit your post, some EVE players might shoot online spaceships to vent their frustration over not being Hitler IRL, eh? Get it through your thick carebear skull...It's "high sec", not "complete sec". Zomg ZOMG!!!!! Spaceships shooting at each other in a core developed PvP game!?!?!?!? Oh, the humanity! Miners elected James. 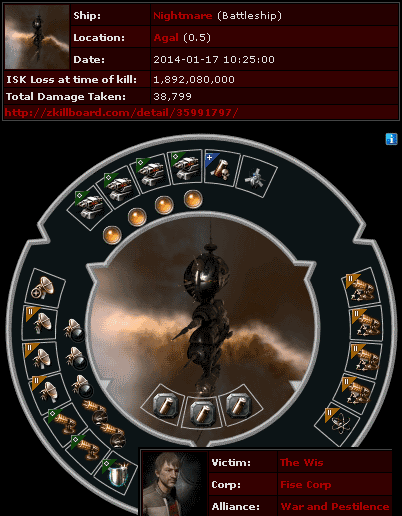 Every untanked barge easily destroyed by a 24hr old alt, was a vote for James. 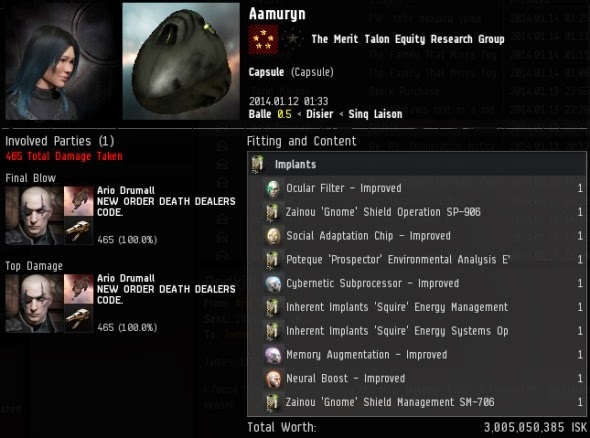 Every impotent care bear stare, every 'my null sec fleet is on it's way' lie, were votes for James. Every internet tough guy local chat, every miner that died with nothing more than a loss mail and hurt feelings to show, were votes for James. Rather than even try to stop us within the game, people who have already turned Eve into nothing more than a calculator with fancy graphics treated it with appalling lack of imagination- and cry to devs for god-hand changes. 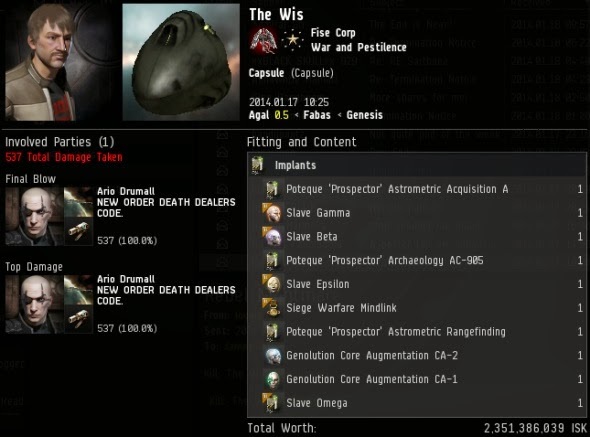 Forgetting that Eve is 10 years old, and legions of mewling miners have come and gone without CCP giving a damn. Votes for James. Their vote equals their effectiveness, the potence, their will. NONE. Sir, If I could upvote/like comments in this thread, I would have done so for yours. Beautiful piece there. I remember the election...maybe Anon was drunk or high? Meh, he was probably AFK. The fact that that Loki has an Interdiction Maneuvers link makes me wonder if it was the product of an ill-advised attempt to participate in PVP without shooting anything. Interesting forensics going on there -- if the Loki was just trying to provide boosters to missioners, I wouldn't expect to see links that reduce sig and increase web/scramble range. I imagine somebody deciding they want to get into an "elite PVP guild" and posting in random chatrooms that they can provide boosters to roaming lowsec fleets and gatecamps, without actually knowing the first thing about lowsec, or PVP. 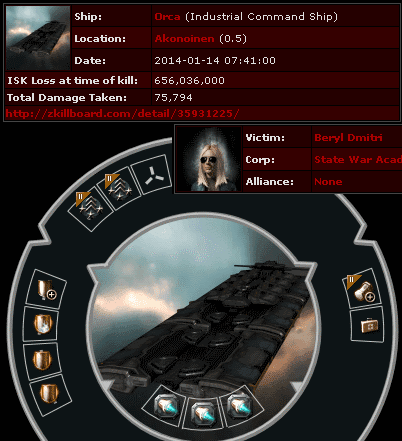 Congratulations to Ario Drumall for his podkill. It's damn near impossible to beat D400 for top podkill. Ario must have the Code in his heart because, with it, even the impossible is possible. Beryl Dmitri added to watchlist. Great job guys! That orca should fit a reinforced bulkhead in addition to the DCU to be harder to gank. And shield rigs instead of cargo. Someone might just kill James315 as a false Messiah...and not in EVE.